My daughter loves Curious George- she had a Curious George birthday party, was George for Halloween and loves the show. As a result I’ve seen every episode + movie multiple, multiple times. Sometimes he’s annoying, but that little monkey has a lot of wisdom to offer too…even when it comes to food, nutrition and diet culture. In season 1, episode 9- “Squirrel For a Day” The Man in The Yellow Hat makes a comment about the cupboards being too small so maybe they should buy less food. 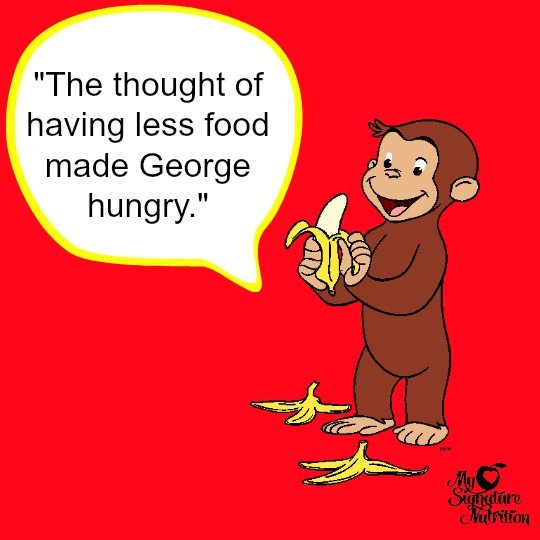 As George is reflecting on this comment the narrator says- the thought of having less food made George hungry. When I heard that comment- I thought George is one smart monkey. His thought perfectly describes what happens with dieting and deprivation. Having less food (self imposed or not) creates deprivation. 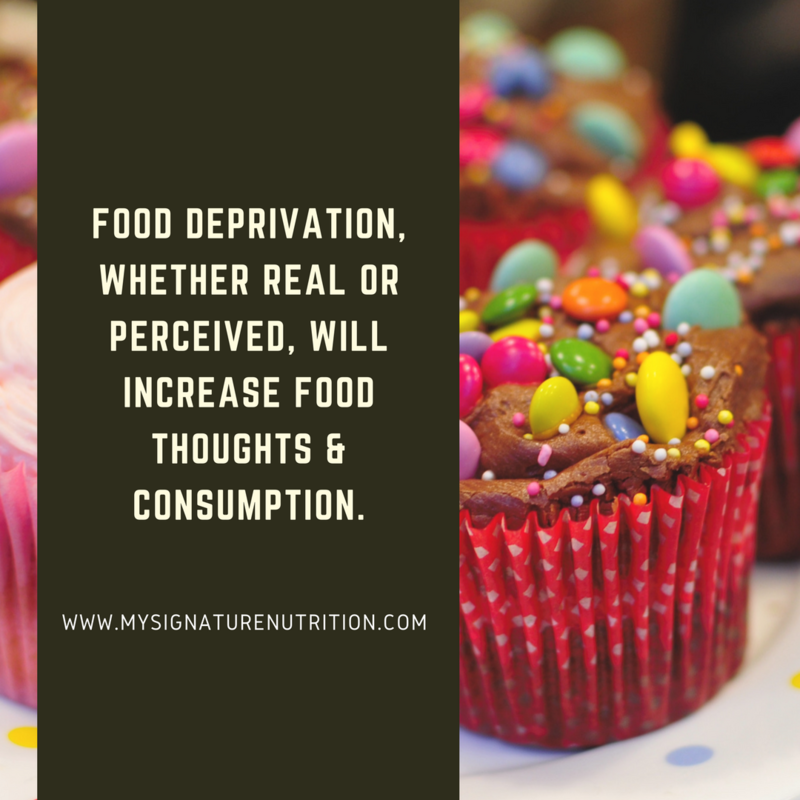 Deprivation causes you to think about food more. Sometimes it doesn’t even have to be actual deprivation- it could be perceived deprivation– the thought that you will start your diet soon, or that Monday is coming and you’ll have to “get back on track,” or that less food might be available can result in thinking about food more and eating more too. When you’re neutral with food, you can clearly see how having less food makes you think about food more. When food isn’t neutral, increased food thoughts make you believe that you’re weak and lacking in willpower. <–This simply isn’t true. 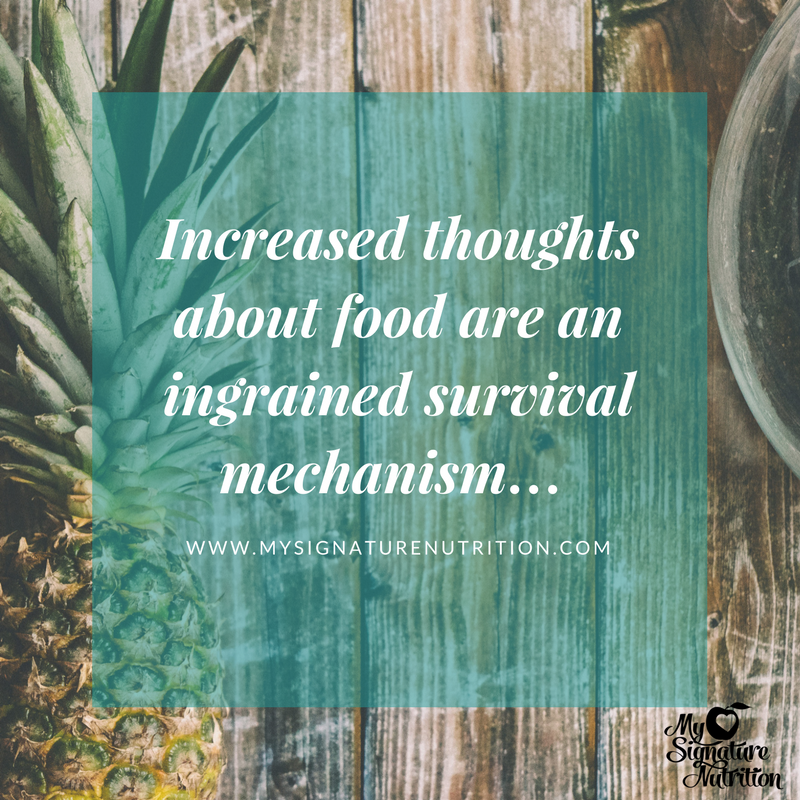 Increased thoughts about food are an ingrained survival mechanism… When food was scarce it was necessary for survival that you thought about food more so that you would seek out and find food to sustain life. The person who didn’t think about food during a time of famine died. Your body doesn’t differentiate between restriction and famines. So as a result you’ll think about food more. What happens when you hold your breath for a long time? Try it real quick and find out. Take a deep breath and hold your breath for as long as possible. When you can’t hold it anymore, what happens next? How do you take a breath? Is it calm and normal? No- it’s a gasp for air and then over a few breaths your breathing normalizes. The same thing happens with food.. If you restrict your eating in any form including: dieting, going too long without eating, aren’t able to eat, or get so busy you forget to eat then you will find yourself thinking about food more, craving more sweets, choosing higher energy foods, overeating, bingeing, and/or eating until you are uncomfortably full. THE SAME IS TRUE FOR PERCEIVED DEPRIVATION. Just the thought that food won’t be available can cause you to choose higher energy foods and over eat. This is a normal reaction to not getting enough food! You can restrict your eating for a period of time, but then just like that ball, POP- you’ll find yourself thinking about food more and eating in response to being over hungry. The more you restrict your eating (a.k.a. the more times you start your diet) the more you’re primed to react to thoughts of deprivation. 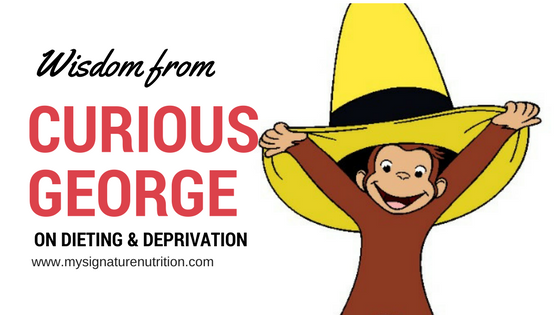 Just like George, the idea of less food will make you hungrier, will make you crave higher energy foods- particularly forbidden foods. This dieting–>deprivation–> increased food thoughts–> reactive eating is a difficult cycle because you may feel like you’re already having too much food and need to change your eating! You might tell yourself that you need to eat less, or better, or that you’ll start your diet on Monday. You might be tempted to restrict your eating to make up for having “too much” or feeling over full. However, when you do that, you set yourself up to repeat the same cycle over and over. It’s just like pushing that ball right back underwater or holding your breath again. Stop restricting your eating. Stop dieting. Nourish your body. Eat. Eat consistently. Schedule an individual consultation with non-diet, intuitive eating dietitian. I’m one and would be happy to help (in some cases I see clients virtually) or I can help you connect to someone in your area. Get my free guide to rejecting diet culture. It helps make it easier to say no to dieting and restriction.